1. Cut out all sugar. This means fruit, dates, goji berries, agave, coconut water and pretty much all the fun things that raw foodists love. It also means no foods that turn into sugar like: rice, potatoes, bread, alcohol, you know, the "bad" carbs. Sugar feeds bacteria/yeast/candida so you want to starve them out. 2. Eat an alkaline diet. Land and sea vegetables are alkaline so if you're a veggie lover like myself, you will enjoy this. Gates recommends 80% alkaline foods, 20% acidic foods which can be animal protein, tempeh, natto, beans and buckwheat. Alkaline seed grains are allowed like quinoa, millet and amarynth. 3. Eat probiotic rich foods. This can be cultured vegetables like sauerkraut and kimchi or fermented coconut water or milk kefir. Probiotics are okay but best taken with fermented foods. Eat/drink these foods soon as you wake up, with each meal and before bed. This will replenish your gut with good bacteria, help you to assimilate nutrients better and improve your overall immune system. There's a lot more to it but that's the diet in a nutshell. It's a bit challenging to follow it perfectly, so I recommend taking one step at a time. Read the book, plan a strategy and go for it. There's a quiz to see if you would benefit from the diet and I didn't even score that high on it. I never thought I had a candida problem but after trying the diet it really was a bigger deal than I realized. The first few days were tough without sugar. I missed fruit the most. I sipped on tea with stevia and made chia pudding with stevia and xylitol (it's allowed). After a week, the cravings subsided and I was feeling great. I followed it for 3 weeks almost perfectly. I had a wedding to attend each weekend so I let myself have a cheat meal once a week (mind you, I said cheat meal, not cheat day) but I still had awesome results. My face, back and chest were almost flawless, I had the flattest tummy ever and my energy level was at eleven. My husband was also amazed how great I looked in such a short amount of time. On top of that I had zero PMS and cramps that month. That's a first for me. The only problem was just at the peak of all of this we went to Costa Rica for 10 days. It was hot and I was craving my fruit smoothies. I figured what was the harm but by the end of the trip my skin was broken out again. So frustrating. We had Thanksgiving (four of them, actually) when we returned and then I had a quick NYC jaunt where some raw treats and coffee accidentally slipped into my mouth. I don't know how that happened. Seriously. Now it's back to square one. With every savory meal I had a side of sauerkraut. In the mornings and evenings I sipped on fermented young Thai coconut kefir. My favorite brand is Inner Eco (plain). 100 billion colonizing probiotics per tablespoon! I use it as a starter to make my own coconut kefir (recipe in my book). Making my own helps save money as I drink about 1/2-1 cup per day. For best results follow it for at least 3 months to a year. Yeah, that's a long time but Rome wasn't build in a day. It takes time to rebalance the body and gut. I did it for my acne but most people who go on it suffer from digestive problems, fatigue, headaches, depression, autism, cancer, food allergies, joint and muscle pain and menstrual irregularities. Even if you don't have any health issues, eating less sugar and more fermented foods is going to serve you better in the long run. So now I'm back home for a while and back on the program. The problem I face is that I'm writing my next book and will have to bend the rules as I develop some of my recipes, especially the desserts. The diet has really influenced the direction of my recipes. I'm going to be using way less sugar and address the candida issue in my book. I haven't seen anyone talk about the sugar problem in the raw diet except Gabriel Cousins and I think it's one of the reasons many people don't thrive on all raw. I spoke with a few people at the Longevity Now Conference and learned that many women were having skin, weight and hormonal issues because of the sugar overload. I know Elaina Love is also doing a lot of sugar free recipes these days. 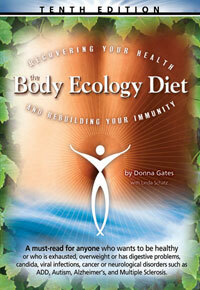 Visit her site as well as Body Ecology to get more info and recipes. You have me convinced but not till after the holidays! LOL! It will be one of my New Years goals. It's amazing how you can change so much by just changing your diet. I've definitely been going down the low- to no-sugar route myself. I've never tried the B.E. diet specifically, but perhaps I'll have to dig the book out and take a second look. we agree, after the holidays we will tackle the sugar issue. we did a candida cleanse last year, and look forward to doing another one. love fermented foods. I'm glad you pointed out that it's tricky to be all raw and no sugar or fruit. It is! I haven't done this type of diet exactly before but I do really love fermented foods. Thanks so much for posting about your experience! You're right about the lack of information on sugar in the raw diet. Most of the focus is on fat content. I just received your book and found your website. Thank you for writing this post. I have been interested in the BED diet for awhile but have been on the fence. Now, thanks to you for such a great review of the progam I am off to order Donna Gates book. I do believe I have a candida issue so this will be a great test! I haven't had a chance to make any recipes from your book yet, but they sure look delicious. Hopefully this weekend I can dive into a few. 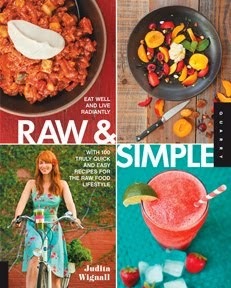 I recently read your book Going Raw and I am considering transitioning to raw in February. Only thing is, I am confused. It seems raw is the best way to go, but here is something new, a B.E.D. Is the B.E.D. the ideal way to eat, or is it necessary for occasional bodily cleansing? I know that every person's body is different, and that the point could be to have a diet richer in nutrient-dense veggies, grains, etc vs fruit (sugar) and fats. What's mroe, most raw foodists reject any and all cooked foods, but in your B.E.D., are you consuming cooked foods? I see that for lunch you adapt your recipes from your book and also have steamed, baked, sauteed veggies. Also, in your book you mention finding a cure for your acne through raw foods, but from your blog I see that this detox is doing the same things. I guess what I am asking is, what is the end-all? I hope to hear your thoughts. I had trouble with my skin from eating an Atkins diet which raw foods helped to balance. Now a few years later I have skin problems from all the sugar in a raw food diet. I'm finding my balance now in raw and cooked foods. You can do BED all raw but it's heavy on fat which I don't like so I substituted with cooked veggies and quinoa. It's all about finding a balance for yourself. I hate dietary dogma and would never say you have to follow a set of rules to be healthy. I think raw is essential and a great way to cleanse but it depends on your state of health, where you live and time of year that is most influential on how you should be eating. I'm starting this plan tomorrow to hopefully cure autoimmune disorder. I wasn't sure ... but would we be able to eat your coconut yogurt on this plan? Yes, you can have the coconut yogurt on BED. I'm 30 and have acne, alopecia (auto immune) and fatigue. I tried raw last year and had great results on the acne, and slower hair loss on the alopecia, and energy. That eventually changed, leaving me with a face full of acne, again. Frustrated, I fell back into the (healthier) SADiet and now I'm a complete mess. I've read the BED book several times now and finally getting a good grasp of what I can eat. I must admit, her book is beyond annoying to read. It's so much information very poorly put together, making you have to re-read several times. I believe that raw foods are fantastic, more so on the raw greens, and I am so anxious for your next book to come out. It seems we are on the same page but I have limited amounts of time and income to research. I just wanted to suggest, if you had a better detailed list or chart or outline of the BED in your book, it would benefit so many people. I was confused reading it, and I'm familiar with most of the items in the book. I can't imagine a newbie to healthy eating would feel trying to decode it. Thank you for sharing your success and failure. It makes me feel more normal. I agree, her book is overwhelming and a bit of a mess to decipher. It's probably why I had it for two years before I did anything with it. I'm writing a section in my book about sugar overload and how it can sabotage any diet. I'm also making a lot of the recipes BED friendly, adding new fermented food recipes as well as making the majority of recipes fast and easy to make (no dehydration!). Eliminating acne is so frustrating because what works for one person doesn't work for others. I hope the BED helps you. Let me know your results. thank you for writing this! I have Donna's book and I have not read it, but will soon. I so agree w/you about G Cousens being the only one in the raw world that does mention the sugar/sweet issue. I am glad you're going to use less sweets in your newer book. I have your current one and LOVE it & have recommended it to many people. Another thing that only Dr Cousens mentions that I discovered myself is raw cashews are toxic (and are in the same plant family as poison ivy). I am kind of mad no one has said anything, as I was eating them w/abandon, and after my 4 or 5th consecutive day of a smoothie w/cashews I realized I was breaking out all over my face, which never happens to me. Long story short, I could not find any mention of that in any of the 17 raw books (!) I have. That is so interesting about the cashews. I've never heard that before. I'm going to look into it. I'm working on some more acne blog posts so I'll be sure to include that. Hope you're enjoying IIN. I loved the program! I have to point out that you're completely overlooking the 80 10 10 diet. Candida is a result of having too much FAT in the diet, accompanied by the large amounts of sugar. You cant have one while having the other in considerable amounts. I highly recommend looking into it. The BED probably works, but at the cost of having to stay on it indefinately. The minute you add sugar, all benefit is lost. After all, does it make any sense at all that fruit ( the most naturally appealing food) is off limits? I've done the 80 10 10 diet and never felt good on it. I've got Douglas Graham's books, went to his lectures, emailed him and I just could not find balance eating that way. I love fruit and started to despise it after a month. I know it works wonderfully for some but it just wasn't right for me. BED doesn't mean no fruit ever again, just until you get the bad bacteria under control. Thank you for commenting. It might be a great option for others. Great post, thank you Judita! I will give it a go too. My skin is fine already, but i know that after just one week of only green smoothies for example, it is peachy and super smooth. So one can only imagine how good it will be after a few weeks of body ecology. The recipes in your book are all raw though, right? And body ecology is just vegan, not all raw, is it? Raw Judita's New Year Giveaway!